Over three years have passed since my unforgettable encounter with the fringe tree frog, Cruziohyla craspedopus, in the Amazon rainforest of Ecuador. That experience is still one of my all-time favorite moments of working in the field. Since then, I learned a lot about this species and nowadays I see them every time I visit Ecuador (as you can probably tell by their growing presence in my frogs gallery). Still, even after all this time the fringe tree frog remains high up on my list of the world’s most beautiful tree frogs. But it felt like something was missing. I decided to take a trip to Costa Rica, and right from the start I had one goal in mind: to find the other half of genus Cruziohyla – the splendid leaf frog, Cruziohyla calcarifer. After researching a little on C. calcarifer’s distribution, I decided to contact the place that in my mind packed the best potential of seeing one. The Costa Rican Amphibian Research Center (neatly abbreviated C.R.A.R.C.!) is a small biological research station located close to the Siquirres River in the Guayacán rainforest reserve, in Limón Province. It is owned and run by Brian Kubicki, a conservation naturalist who dedicated his life to the study of Costa Rican amphibians, with special focus on glass frogs, poison frogs, tree frogs and lungless salamanders. I thought if there is one person that can help me find C. calcarifer in Costa Rica, it must be him. Remember the frog poster from 2003 that I mentioned in the beginning of my post about C. craspedopus? Brian Kubicki was the person signed at the bottom of that poster. Now how cool is that. To begin with, the C.R.A.R.C. Guayacán reserve is stunning. There are many interesting corners with different types of microhabitats, so a huge potential for finding interesting reptiles and amphibians, not to mention arthropods. Unfortunately for me, I arrived to the reserve during a dry spell, as it has not rained for days prior my arrival, and most habitats that were not directly connected to natural springs or the river were fairly dry. Even so, I still found the place highly biodiveresed, and recorded many interesting species of arthropods, some of which I have not yet had the chance to see in the wild. Isn’t it gorgeous? It is hard not to fall in love with these tree frogs. This tree frog species is indeed, as its common name suggests, splendid. It was exactly what I expected. The frog we found was a female, and I was surprised how robust it was. It is not every day you get to see an amphibian that is both colorful and big. As mentioned, we found the frog at night. However, I wanted to see if I can locate it myself so I went back to the same spot in the morning. Let me tell you, it was not easy to find it in daylight. Not only it is difficult to find a green frog in the “sea of green” which is the rainforest, but also the tree frog is hunkered down and blends perfectly with the leaf it is resting on. After some time searching I thought about giving up, but then I looked up. I saw the perfect silhouette of a resting frog on one of the palm leaves, backlit by the sunrays penetrating the rainforest canopy. This could have still been an optical illusion created by a fallen leaf casting the silhouette. Yet, it was indeed C. calcarifer. I couldn’t be happier. To me, seeing Cruziohyla calcarifer in the wild is a way to close a circle on a journey that started over a decade ago in a backpacker’s hostel in Costa Rica, continued in the Amazon rainforests of Ecuador, and ended in Costa Rica again. Splendid leaf frog (Cruziohyla calcarifer) and fringe tree frog (Cruziohyla craspedopus). I wish moments like this one were possible in real life. Unfortunately, such a gathering of the two species is impossible. Even though both Cruziohyla species occur in Ecuador, they are separated by the Andes Mountains. C. calcarifer occupies the northwestern slopes, while C. craspedopus is found in Amazonian lowlands on the eastern side. When people talk about nasty frog secretions the conversation usually shifts very quickly to poison arrow frogs and their toxins. And it is not surprising – these tiny frogs host some of the deadliest compounds in the natural world, some so toxic that they are even lethal to the touch. But the truth is many amphibians have skin secretions, and not all of them are meant to be deadly. One group of treefrogs in particular made a name for itself due to their skin secretions – the milk frogs (genus Trachycephalus). I got up and clumsily walked towards the shower where I found Andy pointing at a big blob completely covering the showerhead. He did say “rana” which means frog in Spanish, so I reached out my hand to grab it. Big mistake. At that time I knew about milk frogs only from the pet trade. The species Trachycephalus resinifictrix is a very popular pet because of its colors and docile temper. I had no idea why members of this genus are called milk frogs, or how they behave in the wild. And so I learned the hard way, that milk frogs are named after their thick, sticky skin secretion. Within seconds of grabbing this giant amphibian my hands were tangled in a gooey mess of what looked and felt like carpenter’s glue. This defensive secretion has very interesting properties – it sticks to anything touching the frog, but in contact with the amphibian’s skin it becomes extremely slimy and slippery, allowing the frog to escape from its captor. Trying to wash it off with water only makes things worse (i.e. thicker and stickier), as it is not water-soluble. I looked for information about the chemical attributes of this substance, but came up with nothing. The only description I found for it was “caustic” (alkaline), and that it seems to be poisonous too. I know what some of you are thinking – where are the photos of the frog in your messy hands? Trust me when I say this, it is impossible to do anything while dealing with this gluey secretion, let alone operating a camera. I spent an hour and half in the bathroom sink obsessively trying to get rid of the stuff. Unless you have something to scrape your hands with, this is not a simple task. Eventually, I managed to somewhat clean my hands, and decided to keep the frog for a short photography session. The species I found was the common milk frog (Trachycephalus venulosus), and it is massive. When we think of treefrogs we tend to fixate on those small or medium sized species, usually green or yellowish in color, often delicate in their appearance to allow swift movement in the forest canopy. However, some species are impressively robust, so much that when they leap and land on a branch they sometimes break it under their body weight. This is the case for the milk frog, I could not believe my eyes how big it was. Females can reach a length of over 10cm and have a body mass of over 90gr. They are indeed heavy jumpers, and they deploy an interesting strategy during landing to better support their body weight: the frog either lands on its abdomen or performs a cartwheel around the branch, while only attached by their adhesive toe pads. Trachycephalus venulosus is an explosive breeder, coming down the canopy to breed after heavy rains. Males congregate around water ponds and wrestle for females. It is often a violent event, after which males and females move together in amplexus (males “piggyback riding” the females) to lay eggs on the water surface. After I got the frog’s sticky glue off my hands along with some of my own skin, I went back to bed. The frog was chilling out in a bucket beside me. In the following morning, I decided to photograph it in “Meet Your Neighbours” style before letting it go. I soon found out that if one is careful, the milk frog can be handled without triggering the defense response. When calm this frog is rather sweet actually, I think I can even see a smile in some of those photos ha ha. I released it back into the forest, putting it on a low tree branch. To my surprise it did not escape immediately. Only when I turned around and started walking away I heard a cracking sound followed by something crashing into leaves. Yup, that’s one heavy treefrog. As the clock counting towards the end of 2014, it is time for another year-in-review post. This was a good year. What a refreshing change from 2013. The main element this year seems to be traveling – I did lots of it. I think I broke my own record for traveling by air, sometimes squeezing multiple destinations into the same month, all thanks to the leave of absence I took from the university. It does not necessarily mean I visited new places; there is still a ton I want to see. The surprising thing is that I do not feel like I photographed enough this year. Many of these trips relied heavily on research, and very occasionally I found myself in a conflict between collecting data and photographing. Here are my best of 2014. I tried to keep the same categories as last year. Well, botfly again in this category, just like last year. I actually had a human botfly (Dermatobia hominis) in my own body last year as well as this year (there is a scientific publication about it on the way – a topic for a future blog post!). Although I have to say this year’s cute parasite was not at all unpleasant, on the contrary! For this reason I decided to go all the way through and have it complete its larval development inside my body, and now I am eagerly waiting for it to emerge as an adult fly. I’m afraid I did not take too many landscape photographs this year. I was more concentrated in other methods (see below) that I completely neglected this photography sytle. In fact, I have just sold my trustworthy Tokina AT-X Pro 17mm lens, because I found that I am not using it anymore. I did have a chance to visit some breathtaking places this year, and chose two shots from Belize as my favorite landscapes for 2014. This photo is not exactly “perfectly timed” in the sense that I had to wait in order to capture the right moment. As I was walking to my cabin in the Ecuadorian Amazon I saw this pinktoe tarantula (Avicularia huriana) resting on a wall that was painted to show a scene from the rainforest. To my amazement the spider picked the “correct” spot in the painting to rest on, a palm leaf, just as it would be in the real vegetation. The cutesy ants painted marching nearby add a nice twist to this photo. This molting amblypygid (Euphrynichus bacillifer) takes this category. I like how it looks like a version of Alien’s Facehugger from this angle. I regard this as one of my best super-macro shots. I have already written a short post about how this unique inflorescence sent me 20 years back in time for a trip down memory lane. What I love about this photo is that I managed to produce exactly what I envisioned. You can read more about my scary encounter with the huge Phoneutria spider here. I admit that my hands were shaking as I was getting closer and closer to take a photo. These spiders are fast. And usually quite aggressive too. In the end this female turned out to be very docile, and she also kindly warned me when I was getting too close. Never in my wildest dreams I imagined I would be photographing a coral snake from a close distance, not to mention doing it alone with no assistance. These snakes have extremely potent venom and should be left alone when encountered. However, in my case an opportunity presented itself and I could not pass on the chance to photograph this beautiful creature. It was carefully released back to the rainforest immediately after the shoot. There is almost nothing I can say about Sabethes that I haven’t already said in this post. This mosquito is nothing short of amazing, and for some insect photographers it is a distant dream to photograph one in action. Too bad they are tiny, super-fast, and oh yes – transmit tropical diseases that can kill you. So I guess it fits the previous category as well. I have seen army ants in the past but this year I was happy to walk upon a bivouac (a temporary camp in which they spend the night). It is such an impressive sight. It is also quite painful if you are standing a bit too close. Taking close ups of the bivouac’s “ant wall” was an unpleasant process, to say the least. I also love this scene where a small roach watches by while the ants form their crawling “rivers”. I rarely take deep focus stacks. The reason is that I like to photograph live animals and this method requires an almost perfectly still subject. This stack of nine images shows one of the most impressive jumping spiders I had the fortune of finding. You can tell I went all “Thomas Shahan-y” here. If there is one style I was obsessive about this year, it is wide-angle macro. I decided to dive in, and experimented with different setups and compositions. I have now gathered enough experience and information to write a long post (most likely split in two) about this method. Stay tuned. In the meantime, here are my favorites from this year. The next photo comes with its own story: On the way to the 700-Feet Waterfalls in Belize for an Epiphytes survey, Ella Baron (manager of Caves Branch Botanical Gardens), Alex Wild and I joked that it would be cool to take a wide-angle macro shot of a frog against the background of the waterfalls, and to use this “postcard shot” to promote future BugShot Belize workshops. 15 minutes after that, I had the shot on my memory card… This is probably my favorite photo from 2014. Along with wide-angle macro photography, I also photographed intensively against a white background, as a contributor for Meet Your Neighbours project. This technique is easy and produces stunning results that it is difficult to choose favorites. I think I like best the photos that still incorporate some part of the habitat, such as the ones below. Shooting for Meet Your Neighbours not only gives a chance to appreciate organisms out of the context of their surroundings, but also makes it super easy to use the images in creative ways. I do not consider myself a competent meme creator, but there are times that I have no better way for expressing myself. Ah, where to start? There were so many great finds this year: timber flies, fringed tree frogs, velvet worms, freshly molted whip spiders, eyelid geckos, tadpole shrimps and more. I cannot simply pick one favorite subject. They were all my favorites, so I decided not to end this post with a trail of random photos. I cannot wait to see what I will encounter next year. Have a good 2015! In 2003 I visited Costa Rica as a part of my first trip to Latin America. One of the hostels I stayed at had a large poster hung featuring many Costa Rican frog species, to show the high amphibian diversity that is found in this beautiful country. This was the first time I saw a photo of a splendid leaf frog, Cruziohyla calcarifer (the same frog appears also on the cover of Piotr Nascrecki’s book “The Smaller Majority”). Back then it was called Agalychnis calcarifer but in 2005, following a revision in the Hylidae family, it was placed within a new genus, Cruziohyla, along with another species. When I saw the photo I was stunned. It looked like a massive tree frog, with eye-catching coloration: dark green (dorsal) and bright orange (ventral). The sides of its body are finely striped in black against an orange background. Its eyes, featuring a vertical pupil – an indication this animal has a nocturnal lifestyle, are orange with a grey center. In addition, the foot-webbing is wide and the adhesion discs on the fingers are large and round, giving it a cutesy appearance. Fast forward to 2014. Visiting the Amazon rainforest in Ecuador, I was mainly searching for interesting insects and arachnids at night. I was fortunate to have good weather throughout this visit, until it started raining heavily on one of the nights prior to my departure. But this rain was like no other I have seen before – it was so warm that a thick fog formed, covering everything in the forest understory. I was about to declare this night a failure for observing arthropods, but very soon I learned my mistake. Following the creation of this natural sauna, hundreds, no, thousands of animals came out of their hiding spots. The forest was buzzing with orthopteran and amphibian calls, roaming arachnids and crawling velvet worms. It was magnificent, a naturalist’s dream. Among the noisy frog chorus coming from the dense canopy, there was one distinct call, louder than the others, which sounded like a short “moo” (remember those tipping-can cow-sound toys? Something like that.) unlike the typical “cluck” call characterizing tree frog species. It wasn’t long before I located the source, and upon seeing it my heart skipped a beat. Sitting on a leaf before me was the second species in the Cruziohyla genus, the fringe tree frog (Cruziohyla craspedopus)! Fringe tree frog (Cruziohyla craspedopus) in its natural habitat. Photographed in the Amazon rainforest in Ecuador. This is, in my humble opinion, the most beautiful tree frog in the world. I know that any attempt I make to describe it will not do justice to its astonishing splendor. The general appearance is similar to that of C. calcarifer, but the green dorsum is marbled with small bluish splotches that resemble moss or lichens and blend perfectly with tree leaves in the rainforest. Moreover, the body margins have “fringes” that are exceptionally long on the hind legs. Males sometimes display them to signal other males or females during courtship by extending their legs backwards. Species of Cruziohyla are characterized by their bicolored iris, which is unique among tree frogs. At rest, C. craspedopus conceals its bright colors and blends perfectly with its surroundings thanks to color patches that resemble lichen spots on leaves. A climbing C. craspedopus reveals its aposematic colors that are reminiscent of a tiger: bright orange contrasted with dark stripes. Note the fringes on the hind legs that gave this frog its common name. Being a high canopy frog, C. craspedopus is cryptic and usually difficult to observe. I have never even dreamed I would have the chance of seeing one, let along in the wild. But spending some time walking in the warm fog I managed to see not one, not two but close to ten individuals. It seems that they like these conditions. After learning their favorite resting spots I could easily find them also by day. Fringe tree frogs descend from the high branches solely for breeding. Pairs in amplexus (typical anuran behavior in which the male grasps the female using his front legs and rides on her back) move about in the canopy until they locate a small body of water with an overhead cover, usually under fallen trees. The females then deposit egg clutches hanging above the water, and the hatching tadpoles drop down and start their aquatic life. Even though I checked under many fallen trees (while searching for Amblypygi) I was unsuccessful in finding egg clutches of this species. Better luck next time. Finding a fringe tree frog during the day is a mission close to impossible. 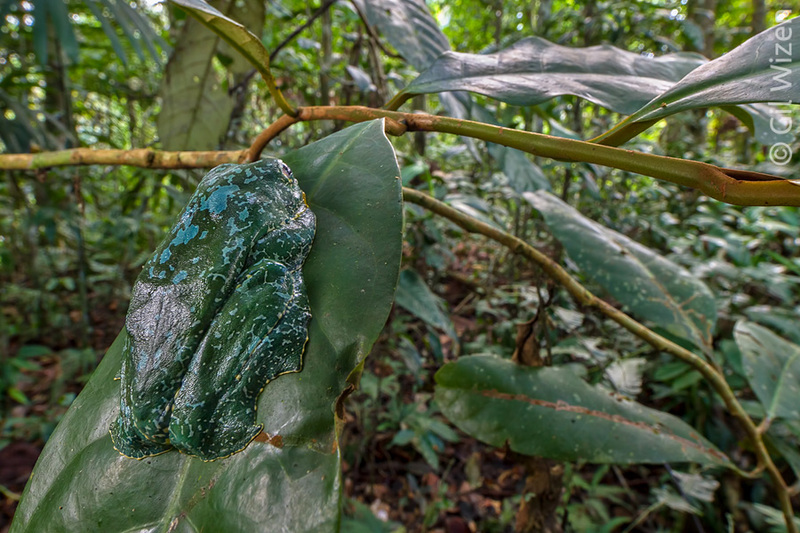 In addition to their excellent camouflage, the frogs tend to rest on tree leaves high above the ground, making it difficult (and dangerous) to access them.